The FDIC budget for 2006 totaled $1.050 billion. 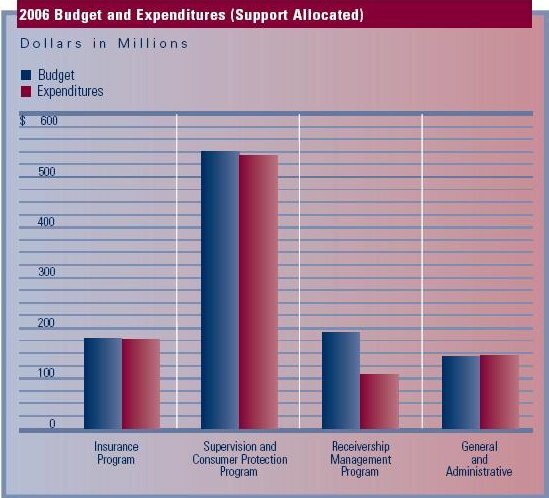 Excluding $146 million for Corporate General and Administrative expenditures, budget amounts were allocated to corporate programs and related goals as follows: $158 million, or 15 percent, to the Insurance program; $557 million, or 53 percent, to the Supervision and Consumer Protection program; and $189 million, or 18 percent, to the Receivership Management program. Actual expenditures for the year totaled $973 million. Excluding $147 million for Corporate General and Administrative expenditures, actual expenditures were allocated to programs as follows: $166 million, or 17 percent, to the Insurance program; $548 million, or 56 percent, to the Supervision and Consumer Protection program; and $112 million, or 12 percent, to the Receivership Management program.